A narrow victory puts Barca back at the top, in front of Sevilla and Atletico Madrid, who were each held to 1-1 draws earlier on Sunday. 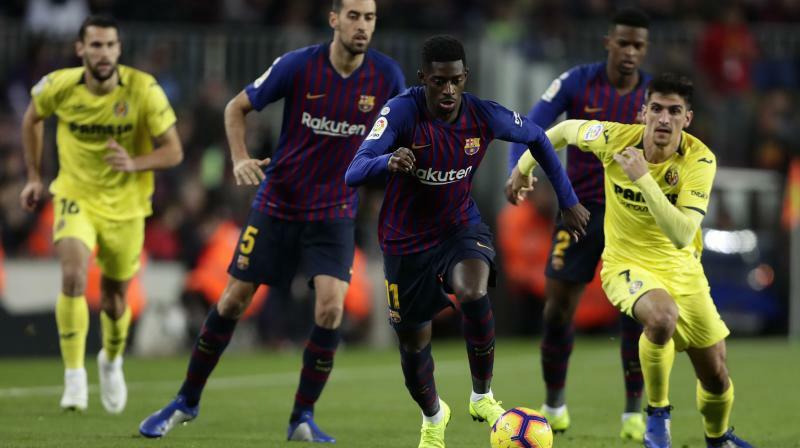 Madrid: Ousmane Dembele took another step on the road to redemption as Barcelona eased past Villarreal on Sunday to move back to the top of La Liga. Carles Alena, the 20-year-old Spaniard also regarded as a star of the future, came off the bench to add a late flourish, chipping in his first La Liga goal and Barca's second after a defence-splitting pass from Lionel Messi. A narrow victory puts Barca back at the top, in front of Sevilla and Atletico Madrid, who were each held to 1-1 draws earlier on Sunday, away to Alaves and Girona respectively. Valverde's patience with the 21-year-old appeared to be wearing thin when he was dropped against Real Betis three weeks ago but a late equaliser against Atletico earned a reprieve, and this was another lively performance. "He played a great game and was one of our outstanding players," Valverde said. "He has so many assets - penetration, dribbling, shooting, speed, confidence, daring. Let's hope it continues like this." Heartening too for Valverde will have been the clean sheet, Barcelona's first in the league since the second game of the season back in August. An early Dembele shot might have gone in had it not been blocked by Santiago Caseres before the Frenchman turned provider, picking out Pique with a perfectly judged cross. Pique held off Victor Ruiz, perhaps even too vigorously, and headed in. Villarreal, however, remained in touch, literally, as Pique was lucky to escape a harsher punishment when he threw a hand into Gerard Moreno's face. When Moreno was substituted he made sure to mutter towards Pique on his way off. Costa's excellent run and first touch panicked Girona's Jonas Ramalho into poking into his own net at Montilivi after the in-form Cristhian Stuani had fired the hosts ahead from the penalty spot. "La Liga is barbaric," Simeone said afterwards. "There are no easy opponents." Girona are seventh, with Stuani leading the way. His goal from the spot was his 12th of the campaign and enough to leave him top of the scoring charts, ahead of Iago Aspas and Messi. Sevilla could have reclaimed their place at the summit but instead became the latest side to be thwarted at Mendizorrotza. Alaves stormed ahead when Sevilla's Sergi Gomez played Jonathan Calleri onside by feathering the ball on its way through, with Jony waiting to finish at the back post. Sevilla were incensed but still left with a point thanks to a smart finish from Wissam Ben Yedder. Alaves stay fourth, with the draw ensuring only two of the table's top six - Barca and Real Madrid - managed to win this weekend.